The following are excerpts from the book: Resorts of South Whidbey Island by William (Bill) Haroldson and the South Whidbey Historical Society, which is available for sale in the Museum bookstore. Through eons of time Bush Point, also known as Willow Point, had always been a gathering place for Native Americans. It was known for its potlatches, which are festive celebrations where the bounty of the sea and the land are shared among all. Then, on the evening of May 18, 1792, the ship Discovery with George Vancouver came to anchor off Bush Point. His historic voyage and charting of the North Pacific would open the door to settlers from Europe. In 1865 Andrew Deming became the first white man to settle at the Point. He cleared the land and established a farm. He grew hay which was shipped to Port Ludlow and Port Townsend. In 1875 he married a Native American by the name of “Catterina.” They became the parents of six children. Deming built a home held together with wooden pegs and square nails. The home was used until it was demolished about 1940. During these early years a Danish sea captain, Christian Madsen, and an Englishman, John Curtis Farmer, became acquainted in San Francisco. They wanted to bring lumber and logs for pilings to San Francisco where they could be sold at a profit. Their source was timber from the Olympic Peninsula and South Whidbey Island. Lumber products shipped on Madsen’s boat to San Francisco became a lucrative business for both men. Christian Madsen had been known as a bachelor Sea Captain. In reality he had been leading a double life. In 1870 he married a Clallam Indian woman by the name of Emily Low. Her white husband had died and left her with three children, Tommy, Emily, and Minnie. Madsen placed his wife and stepchildren in one of the native longhouses and established a small farm at Bush Point. He continued to live in San Francisco or Port Ludlow when not at sea. He made regular visits to Bush Point in a small sailing scow that could be pulled up on the beach. Meanwhile his sailing ship was berthed either at Port Ludlow or Port Townsend. Then one night in 1880, Madsen, a skilled poker player, put up fifteen hundred dollars in a poker hand. His opponent lost the hand and could not pay the gambling debt. In its place he gave Madsen a deed to sixty six and one half acres at Bush Point. Madsen, to make sure of his ownership, filed a claim for the land which was recorded in the county court house. About this time Madsen admitted to being a family man. He retired from the sea and devoted his time to his interests at Bush Point. He prevailed on his long time friend John Curtis Farmer and his twenty year old son John Carlton Farmer to move from San Francisco to Bush Point to build a warehouse and cottage for him. The warehouse was designed as a triplex with the center section designed to pull boats out of the water and store them on dry land. On each side of the storage area there was an apartment. The Farmer family would live on one side and the Madsen family on the other side. A romance developed between young John Carlton Farmer and Minnie Low Madsen, the stepdaughter of Christian Madsen. They were married in 1883. Soon Minnie decided that she and her husband should become property owners. She marched her stepfather Christian Madsen up to the courthouse and put down one hundred dollars in gold coins for the purchase of sixty six and one half acres at Bush Point. Two years later they paid off the farm with an additional three hundred dollars in gold coins. About this time the elder John Curtis Farmer moved back to live in San Francisco. The young couple living on Whidbey Island set out to develop a productive farm. They imported Holstein cows, planted a large orchard, and established a garden. They had chickens for both eggs and eating. They built a store on the beach and built a twenty four foot sailboat, The Egg Box, which they used to carry and sell fresh farm products to passenger and freight ships. In 1914 John Farmer built the store at Bush Point which is still standing today. They also built a dock for steamers to tie up. In 1915 much of the point was platted and sold off as individual lots. John married a young colorful widow, Selma Smiley Davis, from Puyallup in 1919. They lived most of their lives at Bush Point managing their farm. They discontinued raising chickens at the end of the Depression. Selma also became Bush Point’s correspondent to the Whidbey Record writing a column for thirty years. She had a son by a previous marriage, Jess Davis. Mr. Davis became a well known historian for South Whidbey Island. Bush Point was always pounded by storms and winds. Steamships whistled and were hailed in by men in rowboats. Fishermen from all over bartered and traded for fresh vegetables and fruit. Residents would row the four miles to Port Townsend for goods and groceries. Rum runners sneaking in from Canada would throw their bounty overboard if being pursued by the Coast Guard. A local blacksmith fashioned a tool to retrieve the bags of liquor. 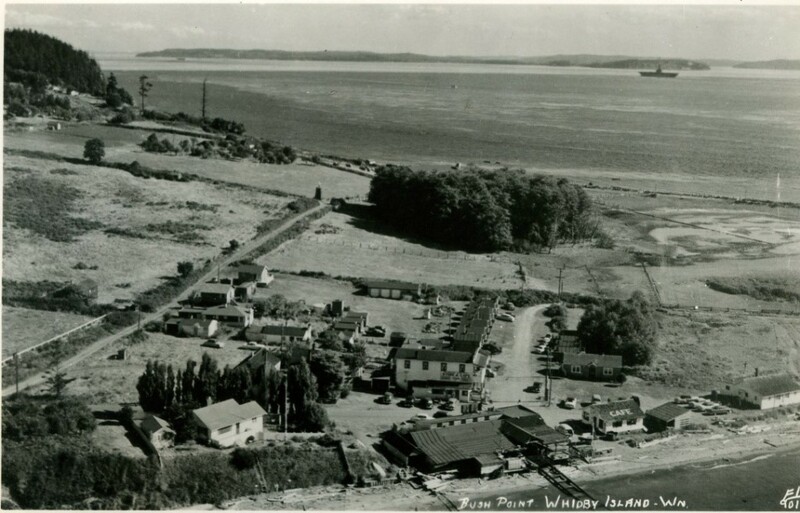 China Spit, a small protrusion of land between Bush Point and Lagoon Point, became the starting point of a cross Whidbey trail to land illegal Chinese immigrants who were avoiding the point of entry at Port Townsend. The trail became the foundation for what is now known as Classic Road. 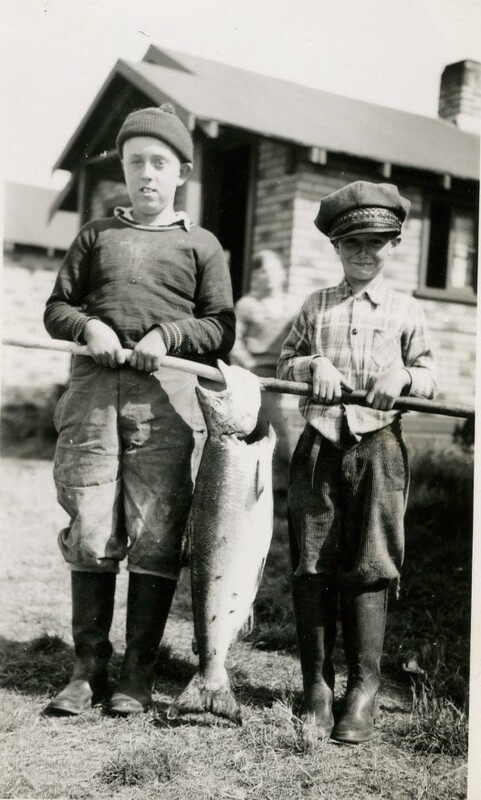 Warren Farmer (left) as a young lad with a big catch. Charles Farmer learned to love the water and the Island. When he was a young boy he went by sailboat to Port Angeles for the mail and supplies. After establishing a post office on the Newell Place at Bay View, he rode horse back down to Bush Point, then back up over the hill to get the mail. As a youngster he and his brother John cut cordwood for a living, but as he grew up, pile driving and log booms caught his fancy. Off he went to Bellingham, Anacortes, Everett, and points of Alaska to drive piling for wharves and traps. But the call of Whidbey was too strong for him, and he returned in 1930 after being away since 1917. There he operated the fish trap at the Point until it was closed in 1932. Charles Carlton Farmer married a widow from the Olympic Peninsula, May Arnold. She had a son by her first marriage, Robert Arnold, who grew up on Bush Point and died in 1941. A son, Warren, was born to Charles and May at the family home in 1934. After the first two years of “resorting,” the Farmers built four single cabins, and John Farmer built five additional boats for them. 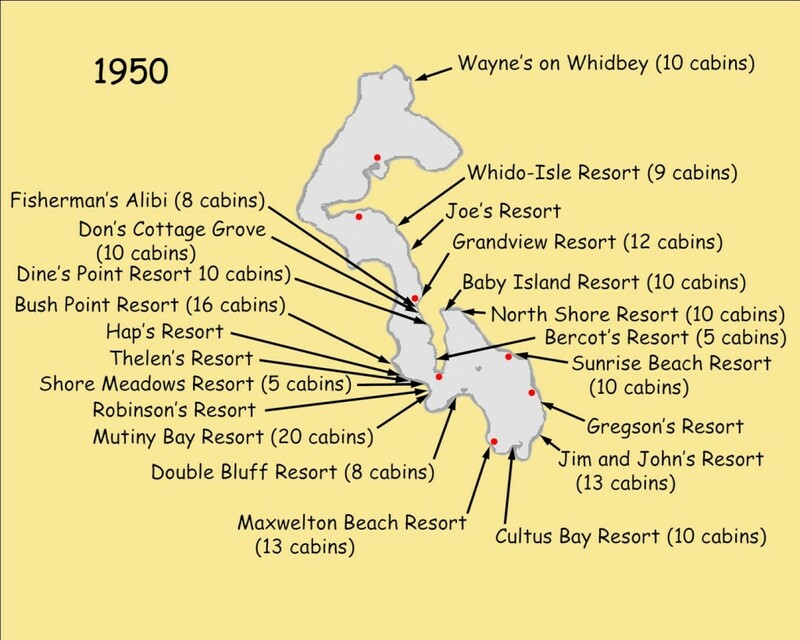 In 1936 six Reinell boats were added to the “fleet,” and by 1940 eight additional cabins were added. Out of necessity to earn a living for his family grew one of the most important industries on Whidbey Island. For it was in 1932, when the government outlawed all fish traps, that Charles Farmer of Bush Point established the first fishing resort on the west side of the Island. 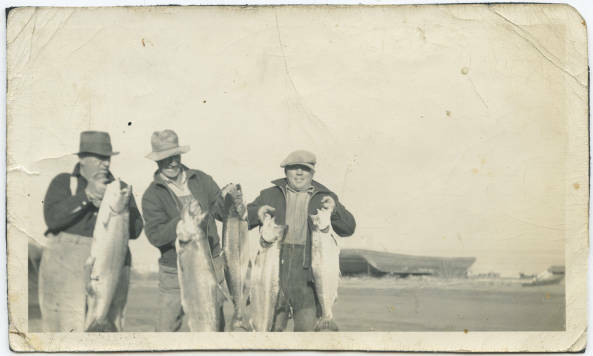 It was widely known that with the fish traps gone, there was still excellent fishing for the sportsman. Fish traps were outlawed because they were so efficient. They nearly destroyed all the salmon runs. This consisted of a bunkhouse for fishermen and three fishing boats. Charles Farmer’s sister Emily with her husband Alfred “Hap” Nelson started Hap’s Resort on the south side of Bush Point near the lighthouse. They built a boat house, eight cabins, and a small restaurant for vacationers.